Editor’s note: This column was co-authored by Emmett McGroarty. Education Secretary Betsy DeVos is a bit of a puzzle. Every speech she gives is a grab bag of praiseworthy philosophical statements combined with dismaying practical proposals. Her recent presentation to the American Enterprise Institute is a good example. DeVos further declared, “[A]t the U.S. Department of Education, Common Core is dead.” That’s nice to hear, but she hasn’t yet acted to assure states they can ditch the standards without federal penalty. Because ESSA is riddled with sub rosa “encouragements” to retain Common Core, along with mandates about the required tests aligned to them, DeVos must do more than simply declare victory. As first steps, she must allow maximum flexibility in ESSA-required state education plans, issue a blanket assurance that standards need not align to Common Core, and issue guidance that interprets other ESSA mandates in as state-friendly a manner as possible. To the extent she can under the law, she must empower states to exercise their constitutional autonomy over education. DeVos also endorsed local control and especially parental authority over education. “Federal mandates,” she said, “distort what education ought to be: a trusting relationship between (sic) teacher, parent, and student.” She also decried state mandates, district mandates, and all other influences that interfere with parents’ desires for the education of their children. “It’s about educational freedom! Freedom from Washington mandates. Freedom from centralized control. Freedom from a one-size-fits-all mentality. Freedom from ‘the system.’” These words could be a rallying cry for any conservative. But. DeVos then pivoted to her Jeb Bush side. 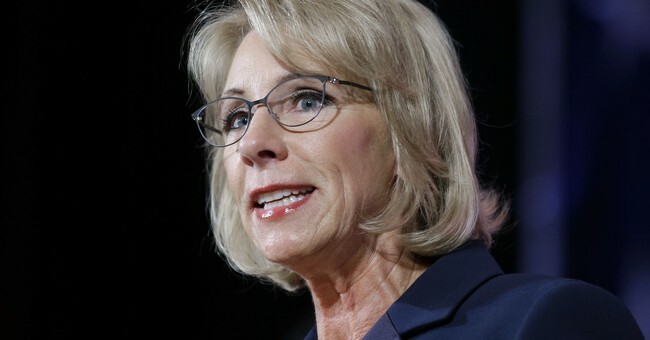 Although she rejected the role of “the country’s ‘choice chief,” she did push school choice (without advocating any particular choice mechanism). She didn’t mention the central problem with this idea: the danger that when the money follows the child, government regulations will be close behind to strip private schools of the characteristics that made them appealing to parents in the first place. As we’ve discussed repeatedly (here, here, here), so-called personalized learning is actually depersonalized, computerized training rather than genuine education. It replaces a liberal arts education with pared-down workforce-development training that concentrates on “skills” corporations deem necessary for the (current) job market. It props children in front of computer screens that feed them curricula (probably not available for parental review) that children can click through without really learning anything. It indoctrinates children with government-approved attitudes, mindsets, and beliefs. It collects literally millions of data points on children that will allow the government and vendors to create profiles and algorithms that may control each child’s future life path. It minimizes human interaction, converting professional educators into data clerks. But Jeb and his colleagues – among whom DeVos has long been included – are fully behind the concept. The concern is that despite her advocacy of local and parental control, DeVos will use her department to push digital learning – especially since ESSA embraces it, through both technology grant programs and computerized-testing mandates. If DeVos is sincere about her philosophical rhetoric, she will devote her efforts to three things: freeing the states from all federal mandates to the extent she can under the law; working with Congress to revise ESSA to eliminate all mandates; and creating a workable plan to shut down her department. That would be something conservatives can cheer.